What is Perlane? Description of the procedure and the results to face. Similar to Restylane, Perlane is a long-lasting dermal filler that helps reduce the appearance of severe facial wrinkles and folds by adding volume and lift to skin damaged by sun exposure and aging. The primary difference between Perlane and other cosmetic gel fillers is that the chemical structure of the hyaluronic acid—the active ingredient in Perlane and Restalyne—allows for richer amounts of HA to be contained in molecules comprising Perlane. Consequently, Perlane is designed to address and correct deeply lined, thicker skin than Restylane, which works better on thin-skinned individuals exhibiting fine lines and mild to moderate wrinkling of facial skin. Perlane is also an excellent choice for patients who want hollows under the eyes smoothed and plumped and the jawline, chin and cheeks re-defined by volumizing and contouring skin that has lost its firmness and elasticity. Additionally, Perlane may also be used to reduce the visibility of various scars, acne pitting and other depressed marks on the face. Manufactured by the same company that makes Restylane, Perlane replenishes facial tissues lacking adequate amounts of hyaluronic acid. Years of being exposed to UV radiation compounded by advancing age depletes the skin of beneficial HA, which is also responsible for keeping the skin hydrated, firm and supple. With one injection of Perlane, your skin will exhibit signs of rejuvenation that include the filling out of cheek depressions, a remarkable decrease in the visibility of fine lines around the mouth, forehead and nose and improvement of deep folds called nasolabial folds that often affect older individuals or those who have lost a large amount of weight in a short period of time. Because Perlane does not use animal products in its ingredients, it is completely hypoallergenic so patients do not need to undergo allergy testing prior to a treatment. Injections are given in the dermatologist’s office and are usually completed within 30 to 45 minutes. Topical numbing agents may be applied to the injection site to reduce discomfort. Patients are advised to avoid taking medications that may thin the blood and increase bleeding, such as NSAIDs and aspirin. Some swelling, bruising and redness may occur at the injection site but these side effects are generally minimal and patients can easily resume their normal activities after a treatment session. The results of Perlane injections can last up to a year, depending on certain factors that your dermatologist will discuss with you. Patients can return for “touch-up” injections at this time to keep their face wrinkle-free and their skin revitalized with injections of Perlane’s rich, hyaluronic acid formula. Although Perlane is more expensive than Restylane, it is the best choice for patients who are experiencing deep wrinkling and folding. Because Perlane’s HA-rich particulates are not found in other dermal fillers, Perlane has been found to be much more successful at dramatically improving the more severe signs of sun damage, aging and acne scarring than other dermal fillers. 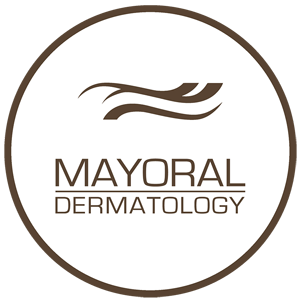 To learn more about Perlane and find out whether you would be a good candidate for this type of cosmetic aesthetic, call Mayoral Dermatology to talk to a licensed physician who can answer any questions you may have about Perlane and its benefits.